The EISB B-Line product line was designed with high port density for the space consumed. 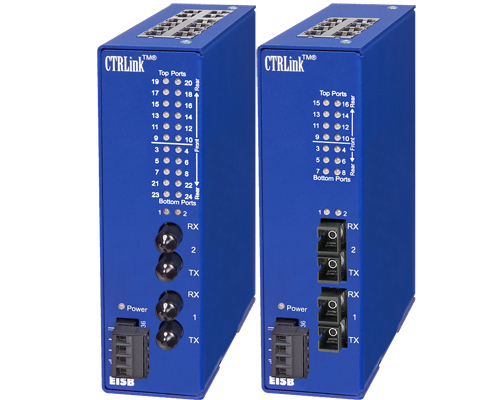 With a constant form factor requiring only 1.75" of DIN-rail space, these switches can support 8, 16 or 24 ports with copper and fiber/copper combinations in a rugged aluminum enclosure. Built for wide temperature range (–40° to +75°C), the EISB switches will operate successfully in extreme environmental applications. The EISB segments the Ethernet LAN into multiple collision domains functioning as a "bridge" between data links to create a larger network diameter than can be achieved with repeating hubs. Each port automatically negotiates with its link partner the data rate to be 10 Mbps or 100 Mbps and either half- or full-duplex operation. Full-duplex negotiation implements the PAUSE method of flow control. Half-duplex links use backpressure for flow control. The switch learns port assignments by reading Ethernet frames and logs source addresses into a table which can hold over 4,000 addresses in the 8-port unit, more than 8,000 in the 16-port unit and more than 12,000 in the 24-port unit. With this information, it improves throughput by restricting traffic to only those ports party to a data exchange — while other data is simultaneously exchanged on other ports. Store-and-forward operation of frames is implemented using 256 kB of built-in memory in the 8-port unit, 512 kB of built-in memory in the 16-port unit and 768 kB of built-in memory in the 24-port unit. Only standard straight-through cables are needed to connect the copper ports to stations or another hub since the copper ports on the EISB8, EISB16 and EISB24 are Auto-MDIX compliant; meaning, that any port can function as an uplink port to another switch or end-station. In addition to one power LED, each port has an LED showing link/activity/data rate by color: green for 100 Mbps and yellow for 10 Mbps. Flashing indicates the port activity. The EISB is shipped with a DIN-rail clip installed. If direct mounting to a sub-panel is desired, the DIN-rail clip is removed and the attached mounting ears can be extended to provide panel mounting. The unit can be operated from wide-range, low-voltage AC or DC power sources. Redundant power connections are provided to accommodate back-up schemes. Seeking a managed version of this switch?